This book sheds light on social policies in six South Asian countries introduced between 2003 and 2013, examining the ways in which these policies have come about, and what this reflects about the nature of the state in each of these countries. It offers a detailed analysis of the nature of these policies introduced in recent years in Bangladesh, India, Maldives, Nepal, Pakistan and Sri Lanka, and illustrates the similarities and differences in policy approaches amongst the six countries. 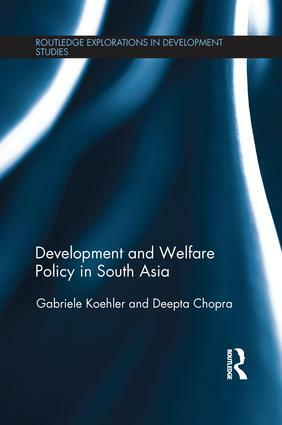 Through this analysis, the book explores the thesis of whether there is a particular type of ‘developmental welfare state’ that can be observed across South Asia. The focus is on social policies or policies designed to address poverty and deliver welfare at the level of programming and design, i.e. the stated intent of these policies. The book also presents an analysis of the fiscal space available in each of the six countries, thereby drawing conclusions about the financial feasibility of a ‘developmental welfare state’ model in the region. This comprehensive book uniquely explores critical aspects of policy debates on a possible move from welfare to ‘rights’. It introduces students and researchers in development studies, social policy and South Asian studies to innovative welfare programmes in South Asia and gives a new perspective on the nature and patterns of welfare in South Asia with the view of tackling inequality and promoting well-being. Deepta Chopra is a Research Fellow at the Institute of Development Studies, UK. She focuses on policy processes, and has extensive experience in managing, designing, and understanding social protection and livelihoods programmes. Her work has primarily been on examining policy processes through the formation of a landmark legislation, the Mahatma Gandhi National Rural Employment Guarantee Act (MGNREGA), India. Her expertise on state-society interactions has allowed her to engage with issues of power and participation and examine efforts to address poverty and vulnerability from the unique perspective of policy. Her current research interests include a focus on gendered political economy analysis of policies on unpaid care work; the design, implementation, and monitoring of rights-based policies (specifically public works); and policy diffusion of social protection policies across South Asia. Gabriele Koehler is a senior research associate with UNRISD in Geneva and a development economist based in Munich. She studied at the universities of Munich, Tübingen, Regensburg, and Ottawa and has worked in senior positions with the United Nations at ESCAP, UNCTAD, UNDP, and UNICEF. She serves on several advisory boards in the field of international development, including the German UN Association (DGVN) and Women in Europe for a Common Future (WECF). Her advisory work and research interests include the development agenda beyond 2015; human rights and human security; employment and decent work; and social policy and social protection in South and Southeast Asia.